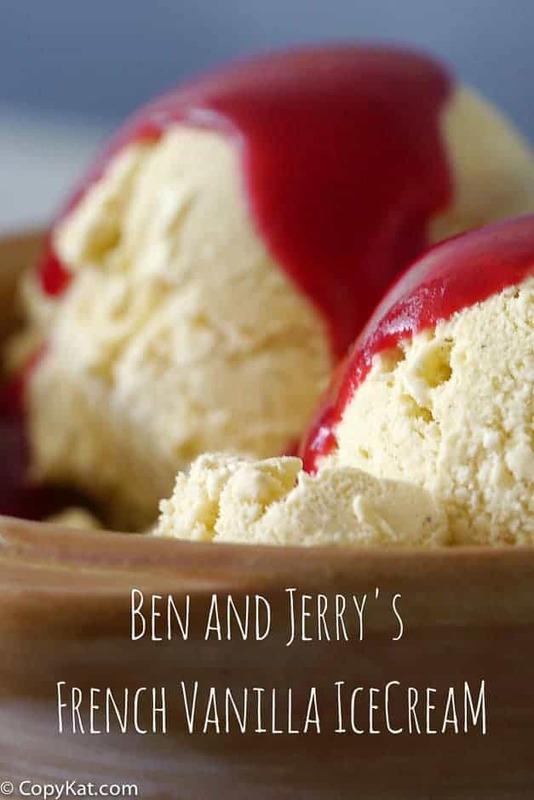 This recipe is from Ben and Jerry’s Homemade Ice Cream and Dessert book. You can find many more of their recipes in this book. Summer just screams for homemade ice cream. Growing up every summer my Grandparents would put on an ice cream social. The ice cream social was made of lots of homemade ice cream, cakes, cookies, all sorts of toppings, and every available relative. It was so much fun. Some of the machines weren’t electric and we had to turn those ourselves. I have always missed those days as an adult, it was the big party to go to. You can make your own ice cream party any time of year. This French Vanilla ice cream is a delicious, creamy, and rich ice cream to try. This recipe is tried and true and you will love the results from this ice cream. Even if you have never made it before, you should give this recipe a try it is super simple to make. Classic vanilla is a great place to start when making your own ice cream. Whisk the eggs in a mixing bowl until light and fluffy, 1 to 2 minutes. Whisk in the sugar, a little at a time, then continue whisking until completely blended, about 1 minute more. Pour in the cream, milk, and vanilla and whisk to blend. Do you have to heat this up first or just use raw 🥚 eggs? Great easy recipe. I like it better with only one egg. It is more creamy if it is whisked for about 5 min before putting in the ice-cream maker. Great tip, thank you for sharing. Easy and fast. Creamy and very good. Flavor -wise, perhaps a bit more vanilla and some salt or add some different flavors for a twist. Has anyone ever tried to make this with Splenda? Results? I haven’t tried making this with Splenda. I will try it out and share my results! This looks good! I will be breaking out the Ice cream maker soon to try this one!